Anyone who has shopped at IKEA knows that stocking up on affordable and confusing furniture goes well with gorging on cheap Swedish delicacies in the food court. Soon, vegans will be able to eat there too. The company is introducing a new vegan meatball - a move that follows their announcement that a vegetarian meatball containing egg and dairy was in the works last year. 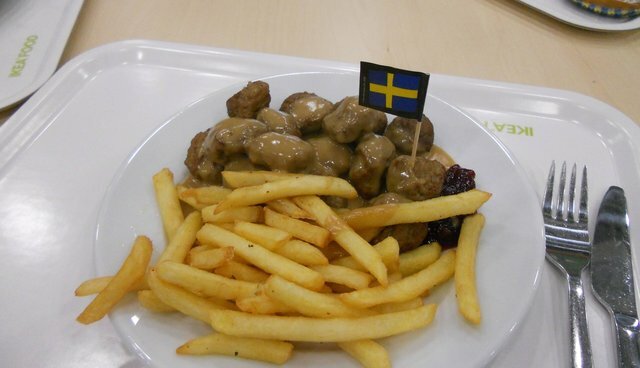 IKEA's efforts to engage animal advocates may have something to do with the 2013 revelation that some of the meatballs served in IKEA cafes around Europe contained trace amounts of horse meat. The scandal was part of a larger issue with European slaughterhouses, and IKEA was one of several companies to recall their products after the horse meat was detected. The furniture giant is trying to rebuild trust in its in-store cafes by offering some new food options, including the vegan meatballs, which debut in April. These veggie balls are part of a larger company push to make the whole company more sustainable - other plans include using more recycled materials and getting rid of incandescent bulbs. The entire company has been free of plastic shopping bags since 2007.